Last month the world population reached seven (7) billion, a landmark event that started me thinking about how this large population might affect the world economy. 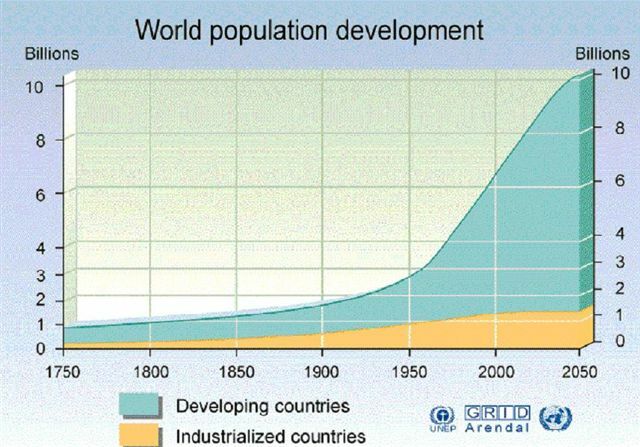 Is our population growing beyond what we can feasibly support? Will we ever be able to create enough jobs for the working age population? As I started looking for answers to these questions, I discovered that the World was too big for me to get my hands around, so I narrowed my thoughts to the United States. In contrast, at its highest point during the Great Depression, unemployment reached 25% (in 1933), but averaged around 15% over the course of the Depression. The Fifteenth United States Census taken in 1930, determined the resident population of the United States to be 122,775,046 in 1930 of which 84,714,782 were of working age. At that high point of the Great Depression there were 21,178,695 persons out of work but on the average about 12,707,217 persons were looking for employment during most of the Depression. But a lot has changed between 1930 and today, mostly due to the advances in technology. Back in the 20’s, 30’s and 40’s, everyday life was very labor intensive. Although factories were becoming more and more automated, they still required human labor to design, build and assemble nearly everything on the assembly lines. I remember my mother talking about working at the Timex plant dong “piece work” which meant putting pieces together to make watches and clocks. Laborers were paid by the number of pieces they could put together during their shift. Factories of all types employed hundreds of thousands of workers in two, to sometimes three shifts a day. Besides factory work, large businesses such as insurance companies, banks, publishing, and the like also employed huge pools of secretarial staff, mail room staff, and other support personnel to work on manual typewriters and stenograph machines putting out the reams of paperwork that kept the businesses moving forward. Outside of the cities, millions of family run farms filled the country side and required hundreds of thousands of hired hands to till the fields and harvest the crops. In 1933, during the height of the “Great Depression”, President Franklin D. Roosevelt introduced the formation of the Civilian Conservation Corps (CCC) as a part of the New Deal. The CCC was a public work relief program that operated from 1933 to 1942 in the United States for unemployed, unmarried men ages 18–25. It provided unskilled manual labor jobs related to the conservation and development of natural resources in rural lands owned by federal, state and local governments. The CCC was designed to provide employment for young men in relief families who had difficulty finding jobs during the Great Depression, while at the same time implementing a general natural resource conservation program in every state and territory. The maximum enrollment at any one time was 300,000; in nine years 2.5 million young men participated. During the time of the CCC, volunteers planted nearly 3 billion trees to help reforest America, constructed more than 800 parks nationwide and upgraded most state parks, updated forest fire fighting methods, and built a network of service buildings and public roadways in remote areas. Today, computers, touch pads, cellular phones and other digital devices have replaced several hundreds of thousands of laborers. We no longer need army’s of typists, stenographers, or switchboard operators to run even the largest of companies. Manufacturing (which has not been sent off shore), has become even more automated with robotic arms assembling even the smallest pieces into working parts that are installed into even larger devices without the single touch of a human hand thus displacing huge numbers of the labor workforce. Think about all the things you do today that until as late as the 1980’s required the assistance of someone else. Take for instance the purchase of airline and hotel reservations which are done entirely on the internet by you. How about self service gas stations and grocery check-out or even shopping in general. Each one of these businesses have been able to down size the amount of staff needed because we, as consumers, have put the burden upon ourselves to purchase goods and services through the internet or use automated teller machines and even pump our own gas and bag our own groceries. While some support businesses still require manpower to operate (i.e. grocery story, cleaners, beauty and barber shops, auto repair, etc. ), those businesses could never afford to hire enough manpower to make up for the displacement of jobs by computers, robotics and other automated devices. And, as large corporations with their streamlined efficiency continue to grow to dominate the marketplace, smaller “mom and pop” businesses will disappear and so too will the jobs associated with those businesses. In the rural communities, family farmers are being forced out of business at an alarming rate. According to Farm Aid, every week 330 farmers leave their land. As a result, there are now nearly five million fewer farms in the U.S. than there were in the 1930’s. Of the two million remaining farms, only 565,000 are family operations. As established family farms are shut down, they are not being replaced by new farms and young farmers. Very few young people become farmers today, and half of all U.S. farmers are between the ages of 45 and 65, while only 6% of all farmers are under the age of 35. So with nearly double the amount of working age persons currently unemployed compared to those unemployed during the Great Depression, my unscientific estimate is that there are less than half the jobs available due to the increased use of technology. Can we create enough jobs to employ all of the working age persons? Actually, there is one industry that despite the advance in technology, that still requires a tremendous amount of labor. That industry is construction, and whether or not construction alone can employ enough persons to make a difference is questionable. The big obstacle to finding out is in the Davis-Bacon Law. With today’s union and prevailing wage regulations I believe that the United States has crippled our ability to maintain our own infrastructure. I know that is a bold statement but it is true. Today we have thousands of citizens out of work and are suffering from the highest high school dropout rates of all times. We have a lot of work that can be done by laborers with minimal education, but the unions and Government Prevailing Wage contracts prevent us from putting many of these people into jobs. I am not saying that we need to pay minimum wage to these workers. Nevada’s minimum wage (which is $1.00 higher than the Federal minimum wage), is $8.25 per hour which during a 40 hour work week would equate to $1,430 per month or $17,160 per year. According to U.S. Poverty Guidelines, a single person making less than $10,890 or two persons making less than $14,710 per year are considered to be below the poverty level. So as you can see, minimum wage does not mean “poverty” wage. In addition, a person earning an income of $1,500 to $2,000 per month (a level of income that would generally make a person with children or other dependents eligible for Temporary Assistance for Needy Families (TANF)), could expect to get a Government check for somewhere between $350 and $450 per month. However, the costs of Government Public Works projects are based upon a “Prevailing Wage” scale that differs by areas or regions on the United States. Prevailing Wages are usually close to Union Wage scales which are far greater than minimum wage for many jobs or positions that require little to no technical skills. Take for instance the construction of a roadway. We have all passed lines of construction barrels along the highway cautioning us to slow down; that we are in a construction zone. At certain construction access points you will see a very tanned female (sometimes a male), holding a sign at the end of a pole. Under Prevailing Wage classifications this person is called a Flag Person. When construction traffic is not accessing the site the Flag Person turns the sign to read “SLOW”, and might give you visual reprimand with their hand if you do not heed the caution. When construction traffic is approaching Flag Person turns the sign to read “STOP”, and is prepared to dodge your bumper in case you do not. While I admit that this job is quite serious and necessary along with being a bit hazardous; the skill level is minimal. The prevailing wage rate for a roadway flag person is $41.44 per hour plus between $1.50 and $2.25 per hour extra depending how far the project is from the center of town. That means that this job pays just over $86,000.00 per year. Receives, stores, and issues handtools, machine tools, dies, materials, and equipment in industrial establishment: Issues tools and equipment to workers and maintains records of tools and equipment issued and returned, manually or using computer. Locates lost or misplaced tools and equipment. Prepares periodic inventory or maintains perpetual inventory of tools and equipment, manually or using computer. Receives, unpacks, and stores incoming tools and equipment, and requisitions stock to replenish inventory. Inspects and measures tools and equipment for defects and wear, visually or using micrometer, and reports damage or wear to supervisors. Repairs, services, and lubricates tools and equipment, using hand tools, spray gun, or pressurized spray can. May deliver tools or equipment to workers, manually or using hand truck. May mark and identify tools and equipment, using identification tag, stamp, or electric marking tool. May be designated according to item stored as Die-Storage Clerk (clerical). At the end of the description you notice the word (clerical). Other than learning to use a micrometer (which by the way takes the same skill as using a ruler), as well as, spotting defects and how to lubricate certain tools, this position is not rocket science and certainly not worthy of nearly $90,000 per year in pay. On a normal roadway construction job there maybe fifty to sixty workers depending on the project size. Many of these workers are highly skilled at driving heavy equipment, and using specialized tools. For the most part these skilled laborers are probably paid what they are worth under the Prevailing Wage system. However there are dozens of Group 1, 2, 3, and 4 laborers making between $42.94 and $43.34 per hour that require very little skill but are required under Union Contracts. These labor classification rates have made it nearly impossible for states and communities to afford to maintain our roadways. Before going any further let me clarify that these wages also includes “Benefits” such as medical insurance, vacation pay, and retirement, etc. However, those benefits only amount to 8% of the overall pay. According to various reports Prevailing Wage rates range between 15% and 25% (depending on the skill), above non-union wages. For example, the median hourly rate for carpenters in Wayne County (the Detroit area) in 2005 according to the Bureau of Labor Statistics, adjusted to include fringe benefits, was $26.33, but the prevailing rate under Michigan law was $41.37. The most salient effect of prevailing wage laws is to raise the cost of public construction. They do so in several ways. First, by preventing competitive bidding on the labor costs of public projects, a greater outlay of tax dollars is required to pay the construction workers employed than would otherwise be necessary. Second, prevailing wage laws often interfere with efficient labor utilization because their enforcement mandates adherence to union work rules. Third, they impose additional compliance costs, including litigation, on contractors. And fourth, prevailing wage laws require additional administrative costs in determining what wage rates “prevail” and also adjudication and enforcement costs. So in theory, if labor costs are 50% of the total construction cost, and we repealed the Prevailing Wage laws each construction project would cost between 15% and 25% less saving the public billions of dollars. And these billions of dollars in savings could be used to fund more projects putting more people to work. There is precedence for the government putting people back to work. The building of the Continental Railroad was in its time a Government backed economic stimulus project The House of Representatives voted for the project on May 6, 1862, and the Senate on June 20 and President Lincoln signed it into law on July 1. Two companies were hired — the Central Pacific would build from the west and the Union Pacific from the east. Besides land grants along the right-of-way, each railroad was paid $16,000 per mile ($9,940/km) built over an easy grade, $32,000 per mile ($19,880/km) in the high plains, and $48,000 per mile ($29,830/km) in the mountains. In 1864, the average pay for constructing the rail road was $8.00 per month or $96.00 per year. Using a conversion based upon the Payment (wage rate) per time period for unskilled labor (see http://www.measuringworth.com/uscompare/). Expressed in number of currency units per time period (for example, U.S. dollars per hour) that same Railroad worker in 2011 would receive $972.00 per month or $11,664.00 per year or $5.60 per hour. In 1933 President Franklin D. Roosevelt introduced the formation of the Civilian Conservation Corps (CCC) as a part of the New Deal. The CCC was a public work relief program that operated from 1933 to 1942 in the United States for unemployed, unmarried men ages 18–25. It provided unskilled manual labor jobs related to the conservation and development of natural resources in rural lands owned by federal, state and local governments. The CCC was designed to provide employment for young men in relief families who had difficulty finding jobs during the Great Depression while at the same time implementing a general natural resource conservation program in every state and territory. Maximum enrollment at any one time was 300,000; in nine years 2.5 million young men participated. Workers under the previously discussed Civilian Conservation Corps were paid $30 a month of which $25 went to their parents. Using a conversion based upon the Payment (wage rate) per time period for unskilled labor (see http://www.measuringworth.com/uscompare/). Expressed in number of currency units per time period (for example, U.S. dollars per hour) that same CCC worker in 2011 would receive $1,410.00 per month; $16,920.00 per year or $8.13 per hour. So, has the world become unsustainable? You tell me! This entry was posted in Environment, Public Interest, Sustainability and tagged CCC, Civilian Conservation Corps, Franklin D. Roosevelt, Great Depression, New Deal. Bookmark the permalink. 6 Responses to Has the world become unsustainable? Very informative article and I hope Craig posts more. However, it seems the answer strayed from his posed question into a union v free markey polemic. A sustainable world debate must surely include a discussion on population control-or even better a natural process of reduction as has happend in Japan where the number of births has fallen below the number of deaths. A similar trend is emerging in Europe. Howerver religious and political dogma coupled with societial cultures that require the elders to be looked after by the younger family members prevent forward movement against a catastrophic human population explosion-similar to the reoccuring explosions in the insect and animal world. Disclosure-as a father of three children I am not without guilt. This interesting discussion touches a nerve. It is a discussion as important as carbon emissions-does any know if it will feature as loudly as carbon reduction at todays conference in South Africa ? Please let me apologize in advance for what could be taken as a rebuke, but only intended as a statement of my personl opinion. I think his question was whether or not enough jobs could be created to keep up with the growing population. (last sentance in the opening paragraph); and the union v free market question definitely figures into that equation, since much work that was previously available is now done by machine rather than humans. I proudly admit, I am one who believes younger family members should look after their elders, do not understand why this would be regarded as impractical, and do not see how it could obstruct “forward movement against a catastrophic human population explosion”. This sort of discussion has been around since the 1970’s, and has always been disturbing to me because of the seeming callousness that it takes to taut what seems to be a “less of them, so there will be more for me” philosophy. My Chinese friends have related to me horrific stories of how their government deals with unwanted population and given some insight into what is involved in government control of reproduction. In short, I don’t believe the solution to “work for everyone” is to be rid of the people that are subjectively considered burdens on the workforce. It is obvious that (except for one profession) what people do to earn a living has changed continually throughout history. As long as there are people, there will always be a need for things for people to live on and to enjoy. Unless desperate, they will only spend or trade what they believe is resonable to obtain these things. Anyone wishing to enter this exchange must have prices that compete with others who want to provide the same thing. Not one person needs to be discarded. What does, is unnecessary constraints laid in the pathway of competetive production (understanding that not all constraints are unnecessary). I hope the lateness of the hour hasn’t too severely affected the tone of this response. If so, apologies. Thank you for your informative and great article. I will use it for further readings and studies for sure. As for your great question: “are we (world population) still sustainable?” I think a lot of effort and work is being done by opinion makers, politicians, and business leaders,generally speaking, for us to conclude that the answer is: – NO! It has been not easy (I must say) also because there are a lot of voices against the ones that ensure the business as usual trend in our world, but I hope I could forecast the winning side of the coin. Along with the population total amount we have the particularities of the population distribution and growth rates; their’s resources consuming processes; the wealth consumption and earnings exchanges patterns; the cultural patterns and the the promoted values and icons in different parts of the world among so many other variables in our societies are being worked out. This precious helping hand has been so efficient in the also so called industrialized world, to the point of the so called “debt crisis we are living”, finally took hold on our economies. (The U.S. debt is over $14.5 trillion, and Fourteen EU countries had public debt exceeding 60% of their GDP at the end of 2010) So we may get there don´t be too impatient! If with less world population we had enough employment and business transactions a few generations back, why should we be afraid of getting more people around? One or two extra billion people and consumers wouldn’t they become a bigger market opportunity and a bigger business activity encouraging profile? (They still eat most of the days and will buy a few things don´t they?) Aren´t there around much better technologies and scientific discoveries today to better rationalize ealth care, the use of natural resources and promote life quality? So we may get there don´t be too impatient! Options to “des-industrialize” and to “des-agriculturalize” our economies and populations were made. In the so called industrialized world we moved agriculture and industry units for what we now call emerging economies or just to get governmental subsidies to balance a few economical ratios, didn’t we? : – so we won´t get them back easily now, do we? We also financed consumption heavily didn´t we? So we won´t be able to pay back our debts promptly with economical and the actual wealth forecast growth, do we?. Wouldn´t these facts be the ones to justify our anxiety now? I would incline myself for a YES response and i think its not really the population growth that is scary: – either in an internal and an external point of view, it’s our social and economical behavior that is scary´, isn’t it? We are different from most world species because of human “intelligenza”? So we should be able to see and turn to the winning side of the coin… UP! As Lewis Carrol once said through some interesting characters regarding the question: – What is the best way to get out of here (asked Alice)? That depends mostly of where you want to get (answered the Cat). Thirdly because I believe an important prerequisite for achieving present (very challenging) and future (possibility) livability is positive framing of the discussion. Of course, the 3rd reason is only worthwhile if it results in positive action. We need to address total footprint holistically rather than focus on energy and climate change. It is critical to hold a vision of enhanced global livability whilst being mindful of the challenges. Putting on my old and comfortable greeny hippy hats, my personal vision is a ‘green peace’ world where we all live in harmony with each other and our shared habitat. This is part of the Mayan prophecies and also of other first nations of the Americas and globe. I think it is (like ‘sustainability’) a form of conciousness or awareness or underlying cultural values. Conciousness determines our actions (individual, collective) which determine footprint. To a large extent, the existing underlying cultural value is consumerism, which we all partake in and understand is making our lives and world unlivable. Imagine (thank you John Lennon) what we could achieve if global resources were diverted from war into nurturing the 3 essentials for human life : air, water, food. There are many who believe stuff like ‘the age of Aquarius’ is ‘humanure’ – our present lemming like path is obviously fraught with danger. All humans say they love their country (not always their society) and their kids – lets prove it! * It may be the case that previous societies were sustainable, or less unsustainable than ours. Certainly, many had a belief in respecting and nurturing their habitat. We can’t ‘go back to caves or teepees’ – we can consider, adapt and adopt some of those values. I also know my life as a kid (many moons ago) now appears less unsustainable. However, both above examples were points on a continuing path that led us to ‘here and now’. Lets find the ‘right’ fork in that continuing path.